Spending a day visiting wineries is always a pleasure. We loved the wineries in the Loire Valley when we were in France last year. We also spent an idyllic week in Napa Valley a few years ago. I have great memories of the beauty of the acres of grape vines, the wonderful food that seemed to be an extension of the wine experience and the stately wineries where the tastings were held. 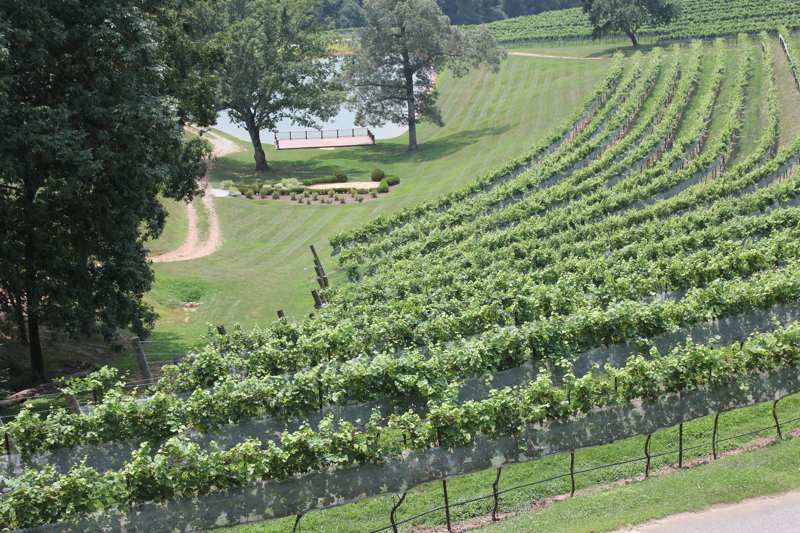 North Georgia has more than 12 different wineries. It just so happens that the Blue Ridge Mountains of Northern Georgia have the perfect terrain and soil to produce wines very similar to the wines produced in Italy’s Piedmont Region. I have been wanting to visit there since I read the post that Sam of My Carolina Kitchen wrote a few years ago. The fact that we have wineries of this caliber so close to home makes me very happy. 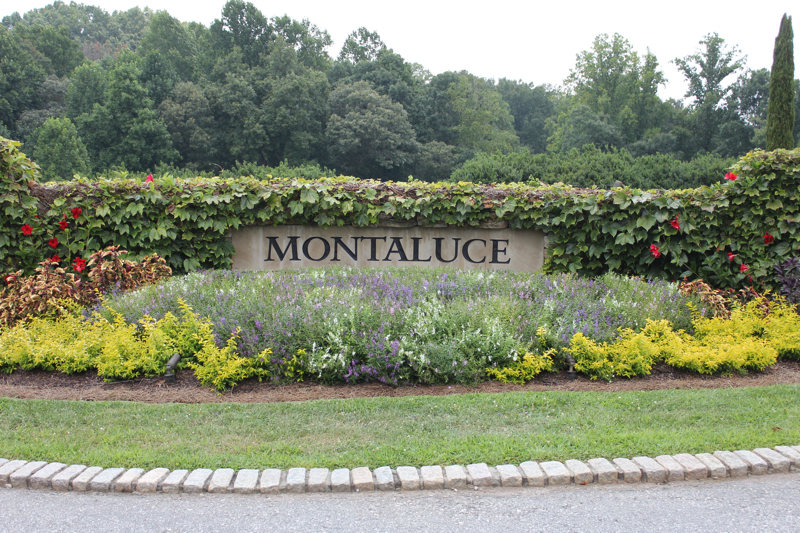 I chose to visit Montaluce Winery because of the beauty of The Tuscan style tasting villa. 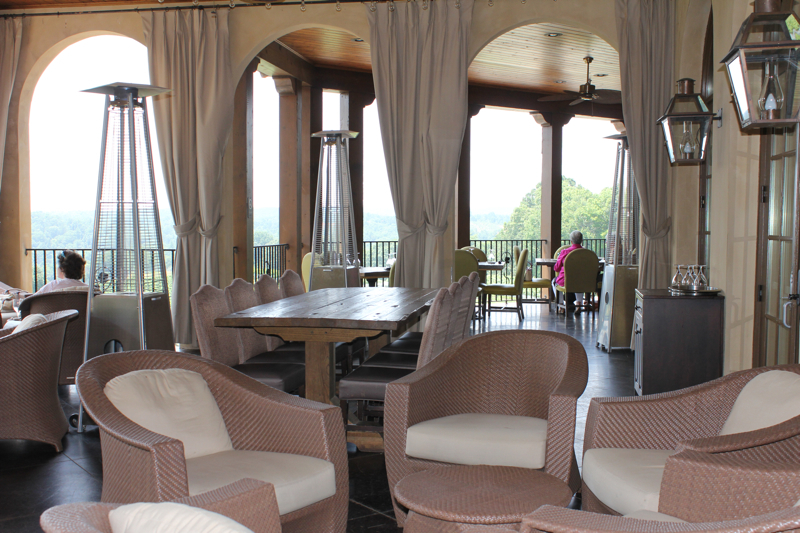 The winery abuts the Etowah River and the Chatahoochee National Forest. It is just outside of the college town of Dahlonega, Georgia. 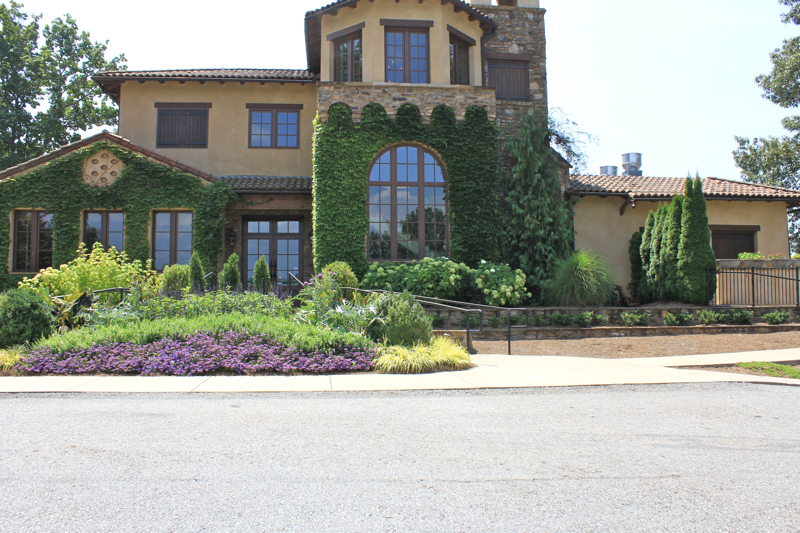 It has sweeping views of the vineyards where they grow 10 different varietal European style grapes. This is the view from the table in the dining room where we had lunch. The restaurant, Le Vigne, was the other reason I wanted to visit. 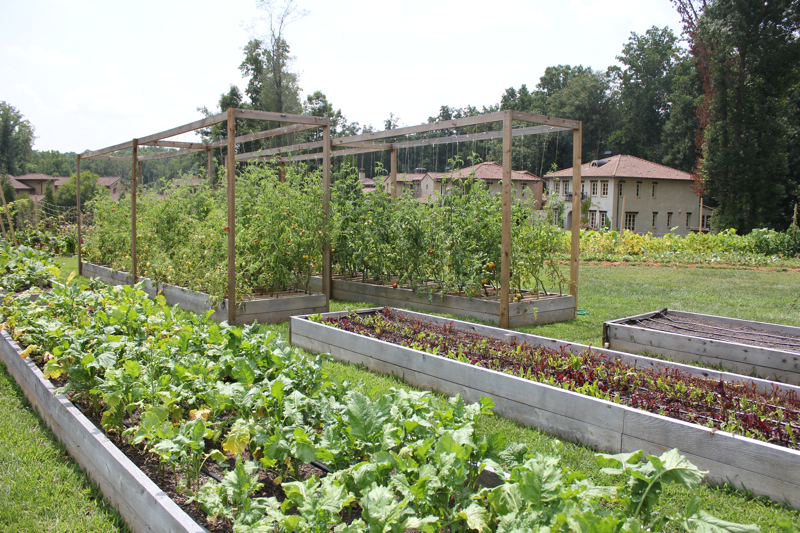 Executive Chef, Austin Rocconi, has designed his menu around the organic ingredients grown in the Montaluce garden and from purveyors participating in the Farm to Table movement. My lunch was something I could not resist. It was a BLT, but not just any old BLT. It included Benton’s bacon. Yes, that’s right Larry, the bacon from your neck of the woods in Tennessee and your very favorite. 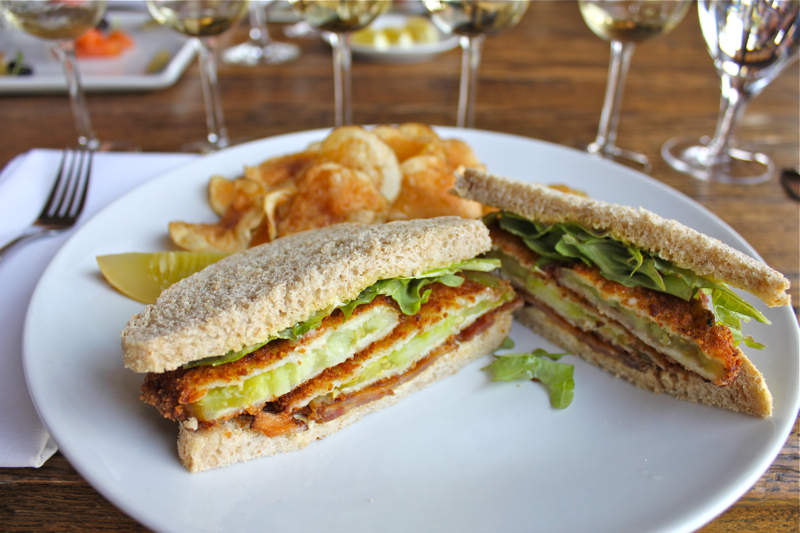 Also on the sandwich were some of the best fried green tomatoes that I have ever had. It was further garnished with heirloom lettuce and a delicious ramp aioli. The bread was also made in house. A very good BLT indeed. Right up there with the sandwich that David Scott and I made from the Benton’s bacon that Larry gave him. And you are not seeing double, triple or more. I had a flight of 5 different Montaluce white wines. I especially liked their 2012 Viognier. David was not too hungry because he had stopped for a late breakfast after trout fishing. 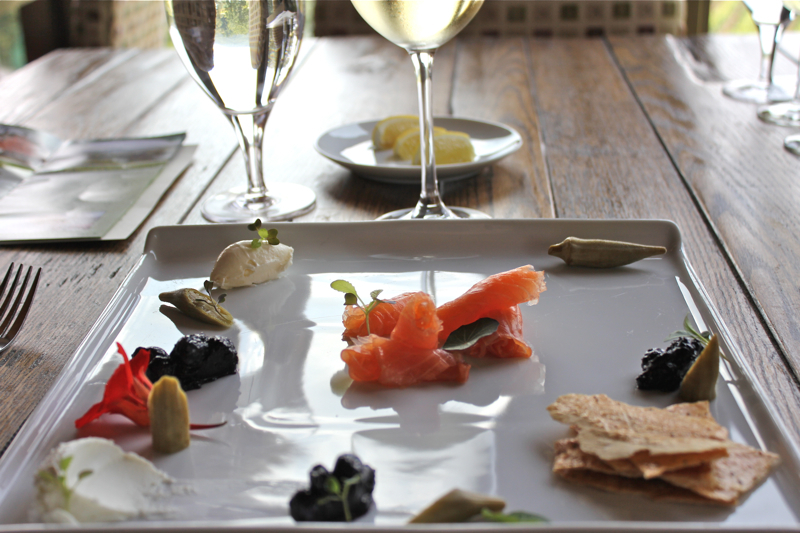 He had a small plate of house cured smoked salmon, creme fraiche, whipped goat cheese, pickled okra and smoked blueberries. But he did end up eating 1/4 of my sandwich and several of my house made chips. Plus sips of my wine flight since he ordered just one glass of the Viognier. Here is a view of their outside eating area. Since it was a hot day, we ate in their beautiful inside eating area. 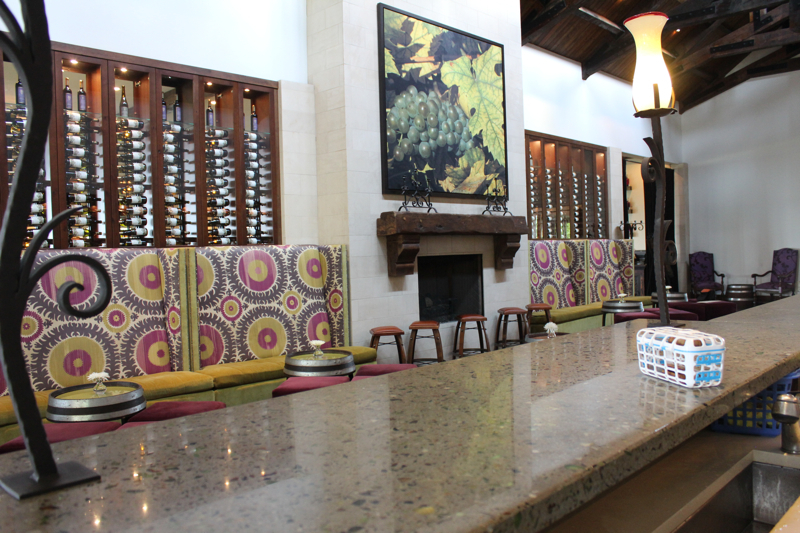 This is a view of the the tasting area. 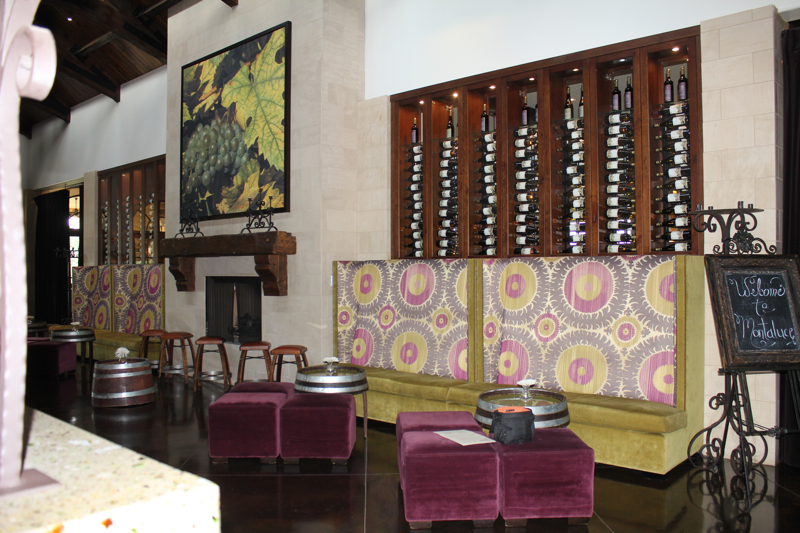 Another view of the tasting room. We had a tour of the winery after lunch and only wished that it was harvest season, which will start in a few weeks, to see the activity of the pressing of the grapes. After leaving the winery we visited the organic gardens. There are still green tomatoes on the vine. 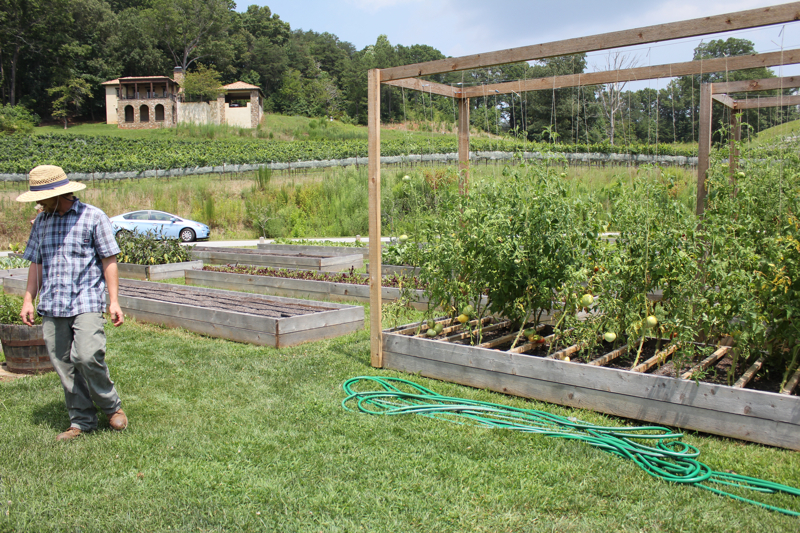 The garden is in transition now between summer and fall crops. It was a special day and we came away with good feelings about the direction that this area of our country is going. 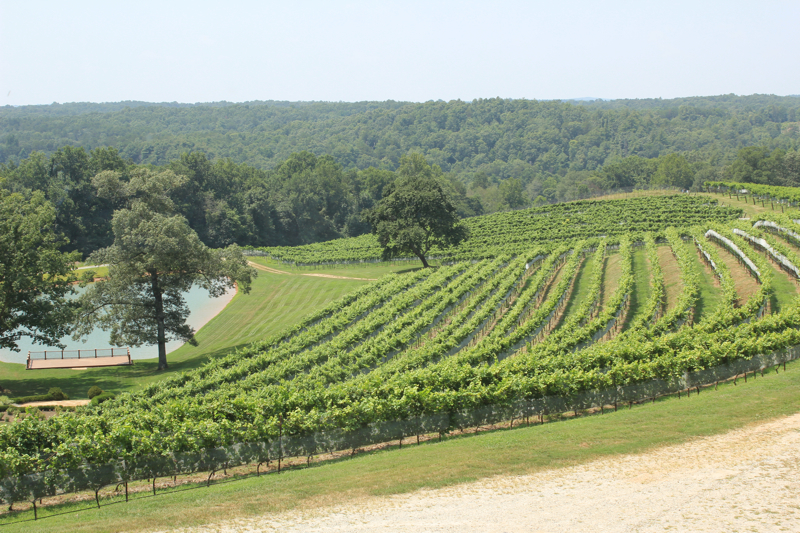 The fact that exceptional wines can be produced from land in Northern Georgia is a promising development. Terroir is a word that sums up what is happening here. Loosely translated it means a sense of place. The combination of soil, climate and geology of a region results in crops that are unique to that particular place. The wines of Northern Georgia have won awards for their excellence. Posted on August 11, 2014 at 6:23 pm. I love a good sandwich. We have lots of company during the summer months and having flavorful sandwiches ready to be assembled is one of my goals. 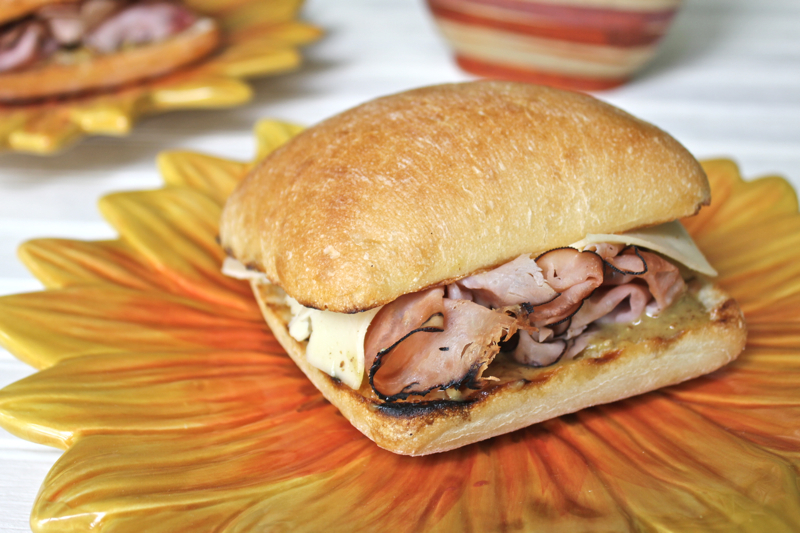 This sweet-ham and havarti sandwich is one of the easiest that I have found. On the back pages of a 1998 Gourmet magazine, this fleeting recipe was recorded. It was not noted by me for many years. I keep all of my precious Gourmet magazines and it came to my attention last week while flipping through pages. Wow, I said to myself; combining crushed pecans, Dijon mustard and orange marmalade for a spread is GENIUS. I changed the bread from pumpernickel to a crusty toasted ciabatta but everything else stayed the same. The spread is awesome. I’m sure it would be good on any number of sandwiches. You might even want to try it on grilled brats for the Memorial Day Weekend. Let’s break out the grills and get the summer rolling. Pulse pecan pieces in a mini-food processor until finely ground. Mix together with the mustard and marmalade. Cut ciabatta rolls in half. Spread with olive oil or butter and grill them cut side down until lightly browned. Spread each slice with some of the orange pecan mustard. Add ham and cheese and, if desired, halve diagonally. Makes 2 sandwiches. Posted on May 22, 2014 at 7:20 am. 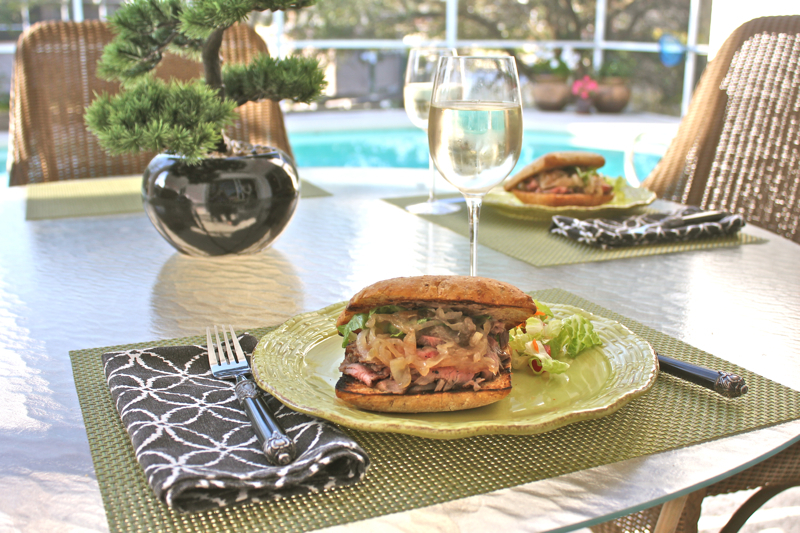 One of the first posts that I shared with you when we arrived in Florida for the Winter was a meal that we had on our lanai. You can see it here. It just seemed appropriate that the last meal that I share with you from Florida would also be outside on the lanai. 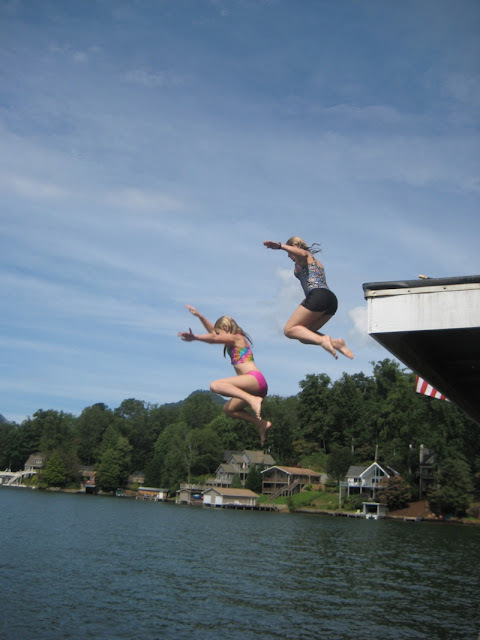 We are leaving for Lake Lure on Sunday. This delicious sandwich is one that I posted three years ago, but it is special so I wanted to repeat it in case any of you missed it. It is one that I made for a contest on Food 52. I didn’t win the contest, but it is still a winner in my opinion. There are several components to the sandwich. All of them can be done ahead of time. The flank steak can and should be grilled ahead of time. You can use your own favorite marinade or the one I have included here. If you want to skip this step, you could always get some good deli roast beef. The pear horseradish mustard is easy to make and the extra will keep in the refrigerator for at least a month. It gives an interesting kick (but not hot) to the sandwich. 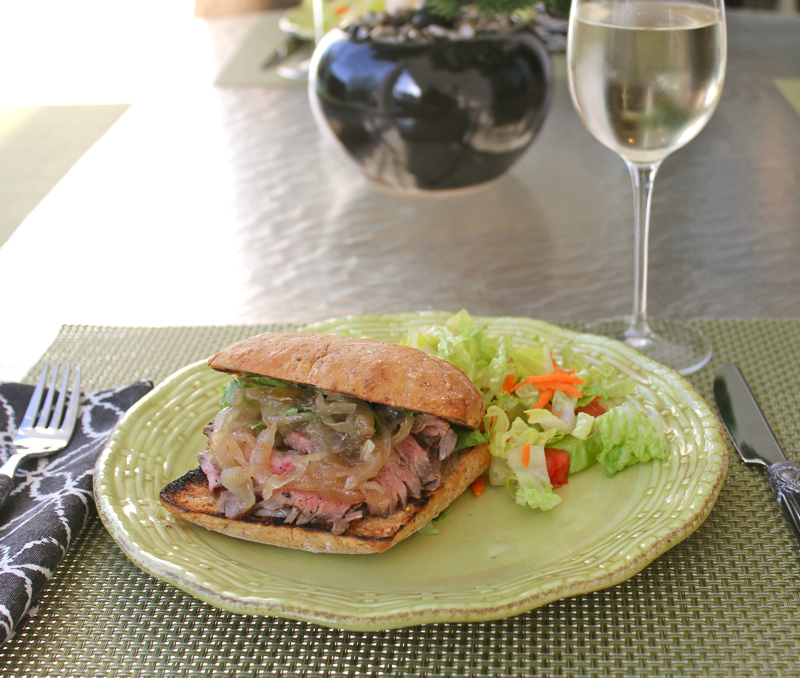 The onion marmalade has a nice sweet and sour flavor, more sweet than sour, that compliments the mustard. 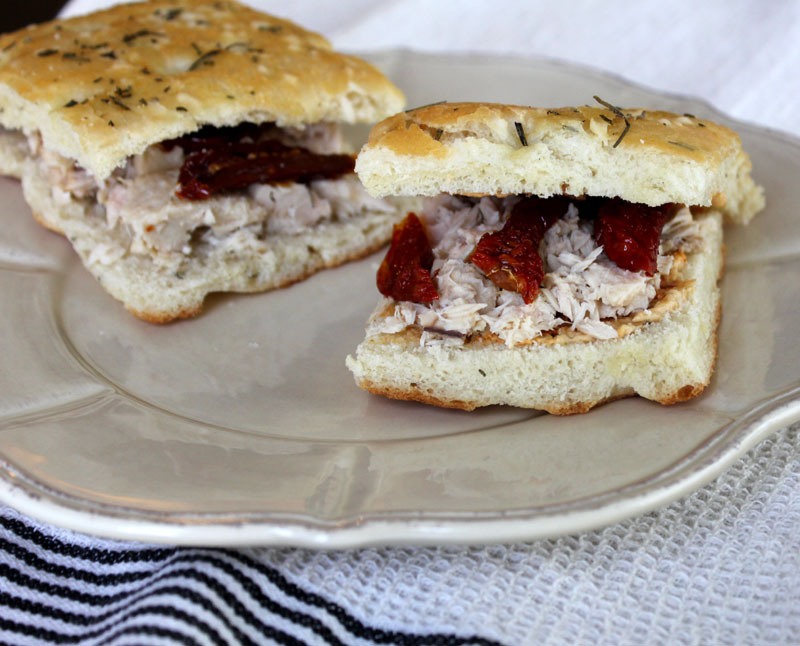 This sandwich is best served on toasted ciabatta bread. 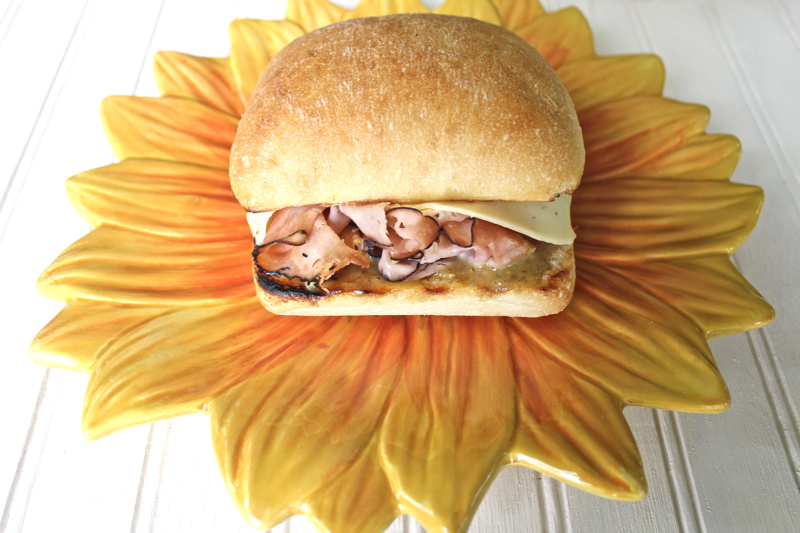 The whole sandwich brings together the elements delightfully. I love it. The weather was warm and sunny on the evening that we enjoyed this meal. It got cold again the next day and we have had cloudy skies and rain. I have no idea what we will find in North Carolina, but like all of you, I am ready for Spring. We are packing and looking forward to being back. I miss my Lake Lure Kitchen. See you back there soon. I am linking this to Tasty Tuesday at The Comforts of Home. 1.Marinate the flank steak in the marinade ingredients in the refrigerator for at least 2 hours or overnight. 2.While steak is marinating, heat the 3 tablespoons of oil in a large skillet. Add the sliced onions and cook over moderate heat until the onions become soft. Add the sugar and cook stirring for a few minutes. Add the vinegar and turn the heat to low and cook until almost all of the liquid has evaporated. If the onions are not as soft as you would like, add the water and simmer, stirring, until mixture is slightly thickened and onions are very tender, about 10 minutes. 3.Prepare grill. Remove steak from marinade and grill it over hot coals turning once until it reaches your desired doneness. Medium rare to medium works best. Remove steak and let rest before slicing it into thin strips. 1.Wrap the cinnamon stick, bay leaf and peppercorns in a small piece of cheesecloth and tie with kitchen string. Add the chopped pears and cheesecloth bag to a large saucepan with the red wine vinegar and wine. Bring the mixture to a boil and reduce heat to simmer. Cook uncovered for about 20 minutes or until the liquid has reduced. Cool slightly and remove cheesecloth bag. Puree the mixture in a food processor. Add the pear puree to a large bowl along with the Dijon mustard and the horseradish. Stir to combine. The pear horseradish mustard keeps, covered and chilled for 1 month. 2.Assemble the sandwiches. Spread the split and toasted ciabatta rolls with 1 tablespoon pear horseradish mustard per side (or to taste). 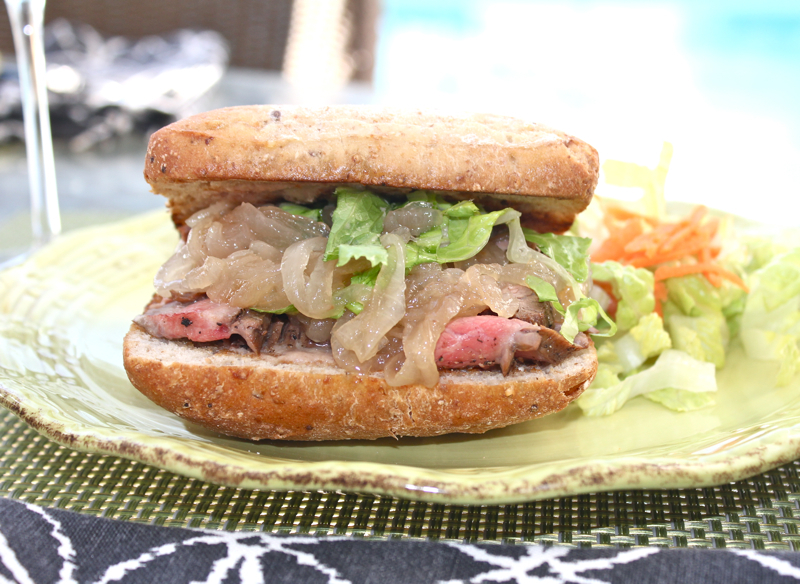 Add the sliced steak and the onion marmalade. Garnish with lettuce. Enjoy! Posted on March 28, 2014 at 10:19 am. BLT’s have become a tradition for our Labor Day family get togethers at the lake. This year’s rendition was one of the best we have ever had. 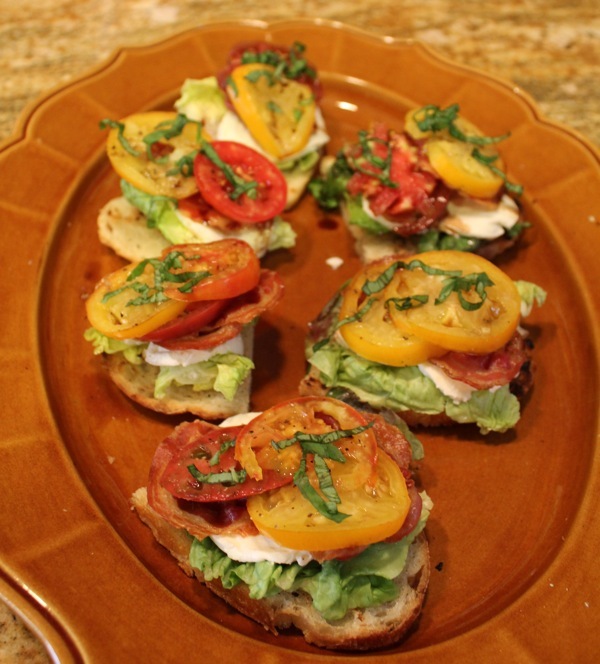 My Daughter-In-Law Kristen is the BLT master craftsman. Each year she tries something new. 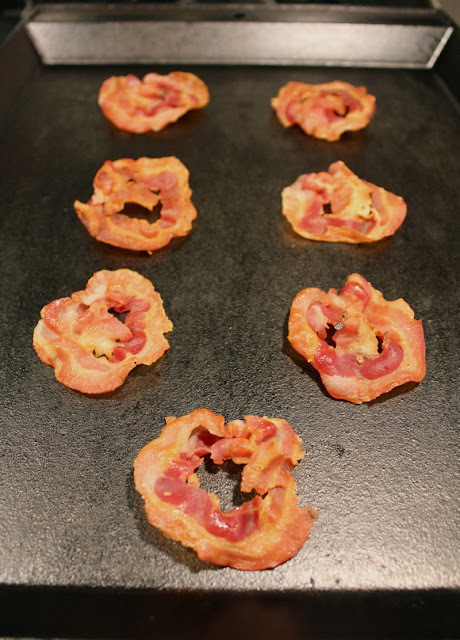 This year, instead of bacon, she made them with pancetta. The pancetta became extra crispy. 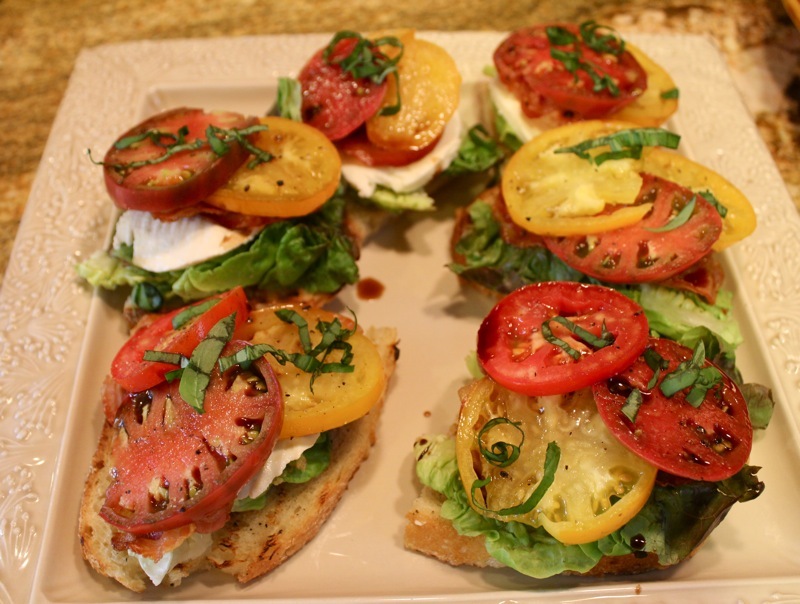 The other components were grilled Italian bread (La Brea Bakery’s Italian Round), crispy artisan lettuce, mozzarella cheese rounds, and three kinds of heirloom tomatoes from Nana Darla’s garden. The lettuce and tomatoes were drizzled with balsamic vinegar and chopped basil. It was served open-faced. To keep everything from sliding off, the layers were added in contrasting textures. 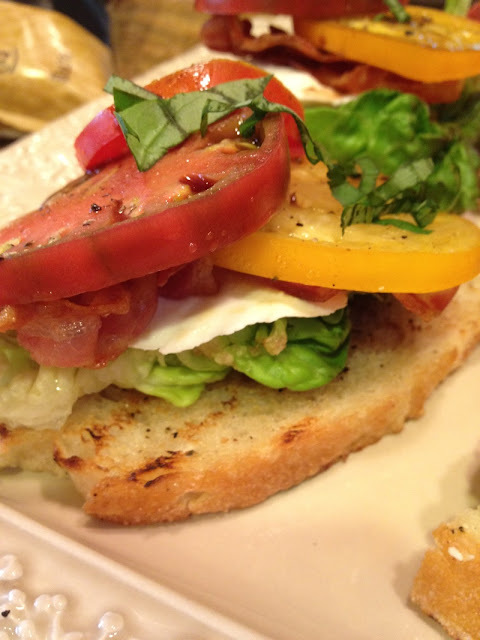 The mozzarella stuck to the lettuce and the tomatoes were placed on top of the ridged pancetta. We devoured two platters of them and felt no guilt as they were free of fattening mayonaise and that extra slice of bread. 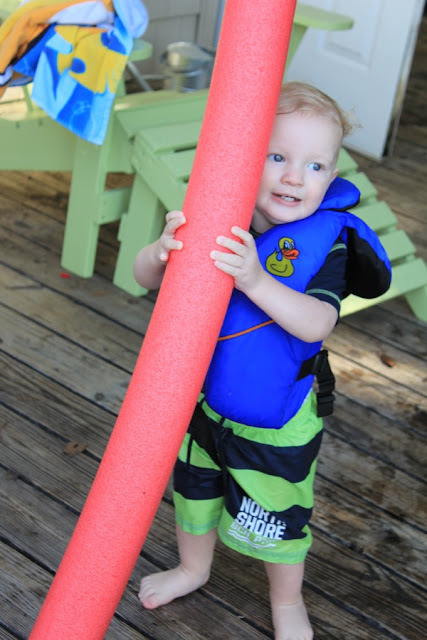 The holiday was a celebration of the end of summer and it was made even more special by spending it with our family. Grandson Cameron enjoyed the water and Aunt Kim and cousin Keenan conquered their fears of jumping from the top of the boathouse. The end of summer at its best! Posted on September 3, 2012 at 3:10 pm. I use rosemary in so many dishes. I stuff it in whole chicken with lemons. 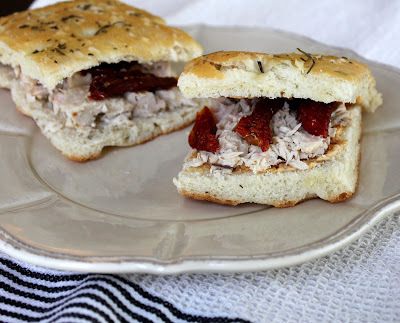 I sprinkle it on pork roasts and I flavor focaccia bread with it. Rosemary is a woody perennial indigenous to the Mediterranean region. It’s Latin origin means sea dew and it thrives in dry soils with just the sea breezes to moisten it’s needle like leaves. 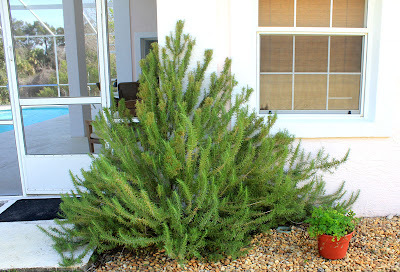 When we first bought our Florida house, I planted a small rosemary sprig. This is what it looks like five years later. 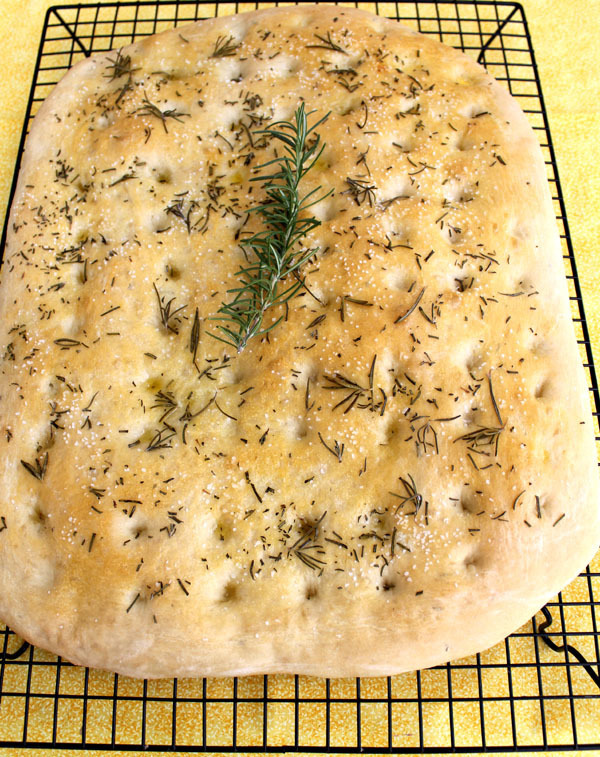 This is a very easy focaccia bread to make. The rosemary is both sprinkled on the top of the bread before baking and added to the dough after an initial steep in boiling water. The bread is good with soup or it can be split to make a tasty sandwich. I am willing to do my part in reducing the risk of losing my mind. The phrase “Rosemary for Remembrance” is more than folklore. Combine boiling water, 1 teaspoon rosemary, and honey in a large bowl; cool to 100 to 110 degrees. Sprinkle yeast over honey mixture; let stand 5 minutes. Lightly spoon flour into dry measuring cups; level with a knife. Add 3 1/4 cups flour, 2 tablespoons oil, and 1 teaspoon salt to honey mixture, stirring to form a soft dough. Turn dough out onto a floured surface. Knead until smooth and elastic ( about 10 minutes ); add enough of remaining flour, 1 tablespoon at a time, to prevent dough from sticking to hands (dough will feel sticky). Place dough in a large bowl coated with cooking spray, turning to coat top. Cover and let rise in a warm place free from drafts, 45 minutes or until doubled in size. Punch dought down. Pat dough into a 14 x 12-inch rectangle on a baking sheet coated with cooking spray. Cover and let rise 20 minutes or until doubled in size. Uncover dough. Make indentations in top of dough using handle of a wooden spoon or your fingertips. Combine 1 tablespoon oil, 1 teaspoon water, and egg yolk; bush over dough. Drizzle with 1 tablespoon oil; sprinkle with 8 teaspoons rosemary and sea salt. Bake at 350 degrees for 25 minutes or until lightly browned. Remove from pan; cool on a wire rack. Posted on March 1, 2012 at 9:16 am.